New Delhi: Continued selling by foreign funds and slowing domestic growth prospects sent shares down 0.5% in early Tuesday trade, extending losses of the past four sessions, with concerns over euro zone sovereign debt crisis further denting sentiments. Besides paring trading limits for banks to curb speculative trading, the Reserve bank of India deregulated interest rates on non-resident external rupee deposits and ordinary non-resident accounts late Friday to boost dollar inflows. “We believe these measures will reduce currency market volumes by around 25-30% over the near term as banks, dealers and corporates transition to the new guidelines. This could lead to a reduction in currency-related fee incomes for domestic banks," Citigroup said in a note. Banks globally are pressured on concerns that efforts to contain the euro zone debt crisis were faltering and tougher rules to strengthen banks’ capital would further undermine their profits. 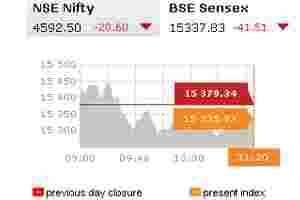 The main 30-share BSE index was down 0.35% at 15,325.39 points by 11:10 am, with 18 of its components in the red. Indian shares are down about a quarter so far this year and are the worst performing major market globally. Foreign funds have been increasingly pulling out money in light of a gloomy domestic growth outlook. “I think there is a continuous selling pressure, which is coming back again and again. Selling will keep on continuing till you have some sort of respite in the market," said Neeraj Dewan, director at Quantum Securities. “No good news is coming on the domestic front in any way. Nothing is happening on the policy front, the biggest worry is the policy logjam." Foreign institutional investors have been net sellers of around $300 million through Friday in 2011, compared with a record investment of more than $29 billion in 2010. There is no major selloff, however, by foreign funds, which are waiting for a growth driver to kick in, Dewan said. Shares in media firm Network 18 jumped 20% early on Tuesday after a media report said Mukesh Ambani, India’s richest man and head of oil and gas major Reliance Industries, is seeking to buy a stake in the company. Other media firms also gained. NDTV rose 5%, while shares of TV Today Network gained about 1.5%. Shares in Mahindra Satyam, India’s fifth largest software services firm, rose 8% after The Economic Times reported on Tuesday that the company and Tech Mahindra were close to appointing merchant bankers for a merger plan. Tech Mahindra bought the firm in 2009, after it was hit by India’s biggest corporate fraud. The broader 50-share NSE index was trading down 0.47% at 4,591.70 points. In the broader market, there were more than 2 losers for every gainer, with 166.8 million shares changing hands. At 11:15 am, the MSCI’s measure of Asian markets other than Japan was up 0.25%, Japan’s Nikkei was up 0.50% and South Korea’s Kospi was trading 0.94% higher. • Orchid Chemicals and Pharmaceuticals rose 4%, after it received an initial milestone payment of $1.5 million, and said it was eligible to receive as much as $100 million in milestone payments. • SKS Microfinance rose 3% after a deputy governor of the Reserve Bank of India said microfinance institutions would be allowed to borrow up to $10 million from overseas markets.